Broccoli as the ingredient for this edition of Weekend Wokking is a really difficult one for us. What are we to do with broccoli!!?!?! Besides sautéing and steaming it, that is. As you know, we always want to be "different." We're difficult like that. 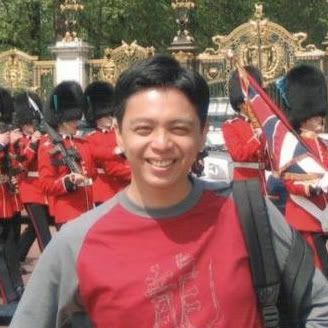 We thought back to a long time ago, when we were oh-so-young, and enjoyed a dish at White Spot called Chicken, Broccoli and Cheese. That item has since been discontinued, to our knowledge... but we haven't eaten at a White Spot for a while... as of late they are trying to be more "upscale." I digress. 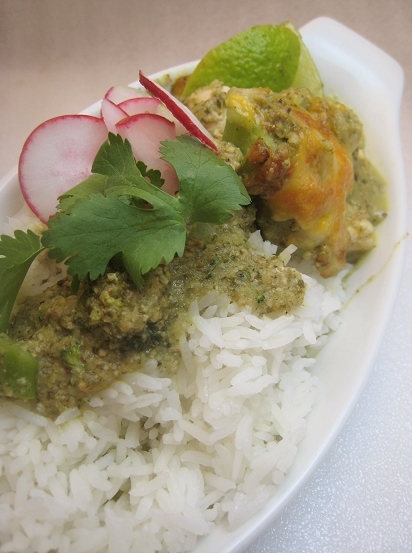 The dish consisted of cubes of chicken breast and chunks of broccoli in some sort of creamy sauce that actually had a hint of curry (which was not indicated on the menu). As for the cheese part, I'm guessing that it was in the sauce as well... but it's all a bit hazy now. It was served with some sort of rice pilaf. 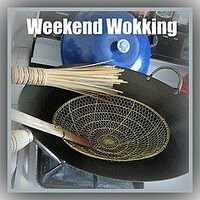 So, we thought to recreate that dish for our Weekend Wokking entry. 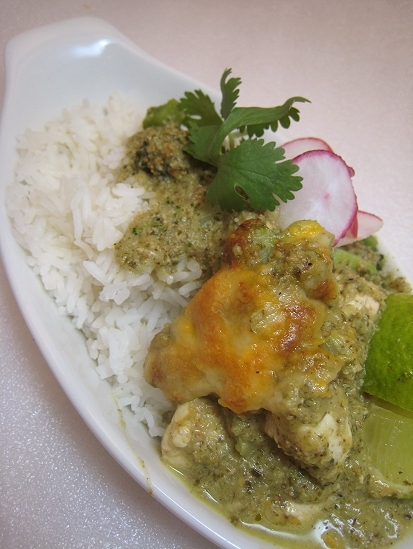 But, planning it in our heads, as we thought to make a bechamel-based sauce cheesified with cheddar and kissed with curry, then assembling it with poached chicken and broccoli florets for a stint under the broiler, JS had a change of heart. "Why not do the same assembly and prep work, but with a pipián sauce instead?" Hmm, very intriguing. I wasn't too attached to the nostalgia dish of Chicken, Broccoli and Cheese, and thinking how the green-colored sauce will match the broccoli, I agreed. 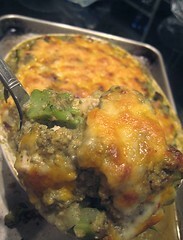 In fact, this dish can still be called Chicken, Broccoli and Cheese! I guess seeing this post on pipián on Homesick Texan had something to do with the change of heart. 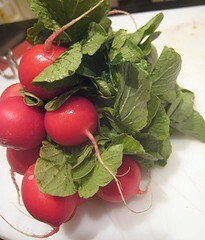 We start with the most time-consuming component of the dish. I couldn't get over how serene and luminous that green pipián was on Homesick Texan's page. I looked over the ingredients and it seemed like it was very doable. I'm always an optimist when it comes to recipes. Maybe it has something to do with the fact that I'm incapable of just following recipes strictly. The recipe called for chicken broth and we didn't have any in the house. We do have some whole chickens and we were debating whether to poach them for broth. Fortunately, CSC roasted some chicken the day before and we had some leftover chicken legs, along with the back. So, in lazy-people-way, I just decided that the carcass of this already-baked chicken would serve to make broth for our pipián verde. I started by toasting the pumpkin seeds. We didn't have a lot of pumpkin seeds on hand, just half a cup. 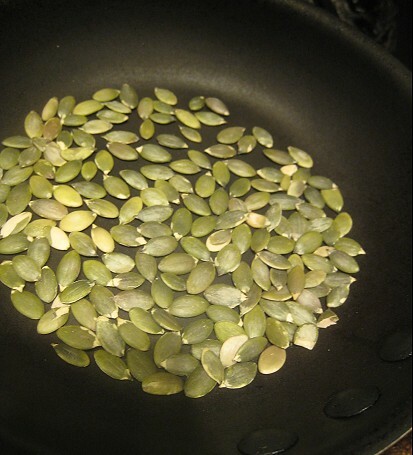 Of course, you think that I would modify the recipe to reflect the pumpkin seeds on hand. Somewhere along the way, I got too lazy and didn't want to keep track. In fact, I more or less "winged it" the rest of the way. 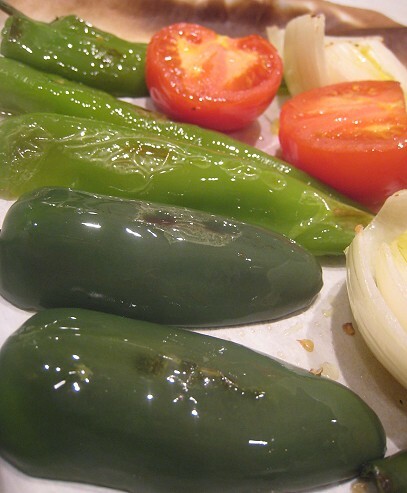 While the pumpkin seeds were toasting, I put a couple of Anaheim, jalapeño and serrano peppers on a baking pan, along with some garlic, tomato, and an onion. I put them under the broiler to char. 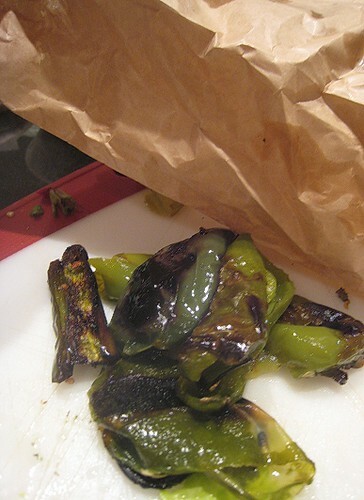 Afterwards, I put the peppers in a paper bag to steam. I peeled the skins and they were ready. 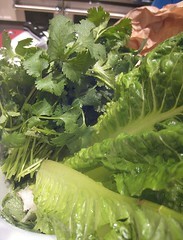 The recipe also called for a can of tomatillos, a couple of radish leaves and romaine leaves, and a few sprigs of cilantro. I pushed all into the food processor -- peeled roasted peppers, toasted pumpkin seeds, radish leaves, cilantro and romaine -- wetted them with some chicken broth, and tried to buzz them into a smooth paste. 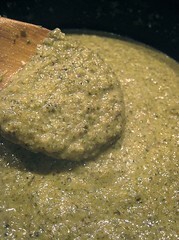 I also added salt and pepper and about a couple of tablespoons of cumin powder. 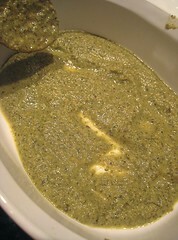 Our food processor was not powerful enough, so I was left with a very, very chunky sauce. I tasted the sauce and I thought it was pretty good but seemed to lack some body. I added a couple of bay leaves and more salt. I tasted again and it was still lacking the body. I was starting to worry, but figured that since we were going to be adding cheese to it, the cheese would round out the pipián nicely. 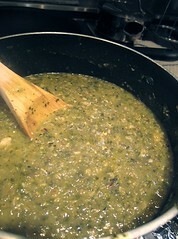 The pipián verde needs to be heated and simmered until it was thick-ish. 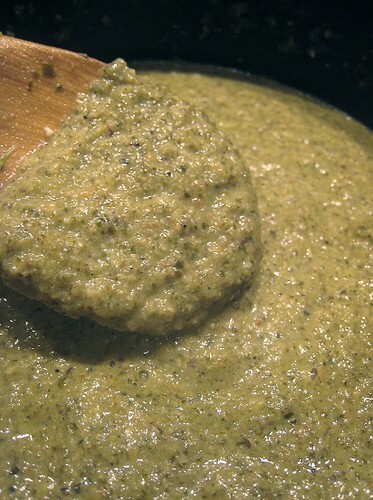 After about 20 minutes or so, the pipián goes into a blender to be blended into an even smoother sauce. Once the pipián verde was where I wanted it to be, I turned over the sauce to TS to assemble with the chicken and broccoli. Compared to all that work for the sauce, the chicken and broccoli took no time at all. 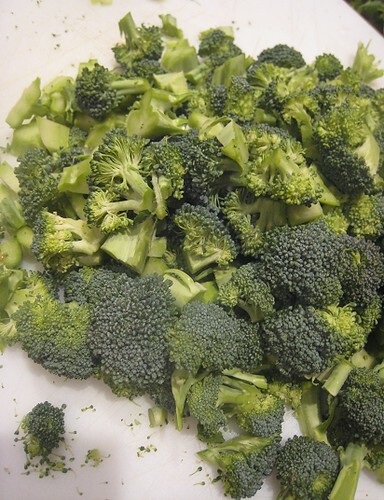 I cut the broccoli (including the stems, of course!) into little chunks, then cooked them in some chicken broth (made from the previous night's leftover roast chicken and its bones). When it was still fairly firm, I took them out. It was the chicken's turn. We don't usually buy chicken breasts or solely use them for a dish. For these breasts, I took them off of a whole bird. 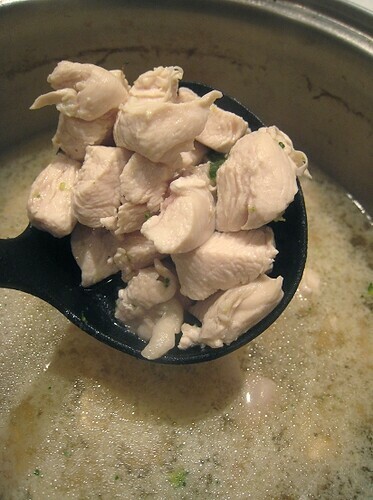 I diced them and poached them in the same chicken broth until just barely cooked. They joined the cooked broccoli. Even though we subscribe to the breasts-are-not-the-best-part-of-the-chicken school of thought, sometimes their soft, pillowy, white selves are quite endearing. Teehee. Look at them, so cute. First, a layer of pipián. 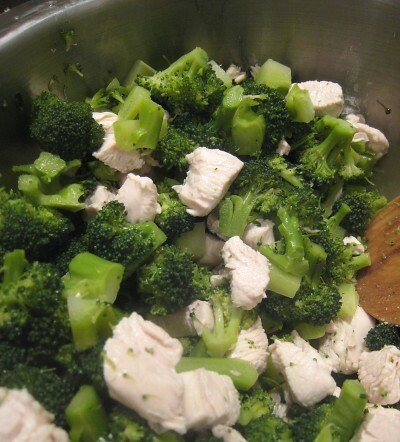 Then, chicken and broccoli. Then some cheese. We confess! 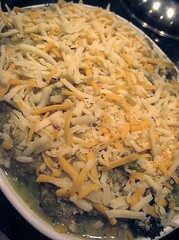 This was some Kraft Tex-Mex blend that we had to use up (blend of cheddar and jack cheeses). Repeat layering until you reach the top. 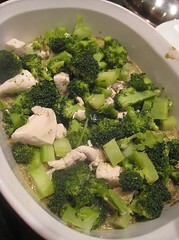 In our case, we were a teeny bit overflowing because I wanted to put in all of the chicken and broccoli into the dish. The dish went into a hot oven (about 425F) until bubbling and the cheese had browned. We ate it with rice, of course. This dish was quite yummy, in that very comforting sort of way. I had a couple of servings and I couldn't seem to stop eating. The cheese that melted into the pipián did all the bodywork for it. The pipián verde was smooth, nutty, and deep. If there is anything, I would have liked it to have more of a kick to it. I ate mine doused with a lot of Tapatío hot sauce (which I brought all the way from LA). Surprisingly, this tasted similar to the White Spot version of Chicken, Broccoli, and Cheese. Well, perhaps just because of the cumin. Our pipián verde had more complex notes from the toasted pumpkin seeds, which made all the difference. The host this month is Wiffy of NoobCook.com. I like everything about this dish! It is defintely one of those comfort foods. Broccoli can be one of those "what shall we do with this" kinda foods. 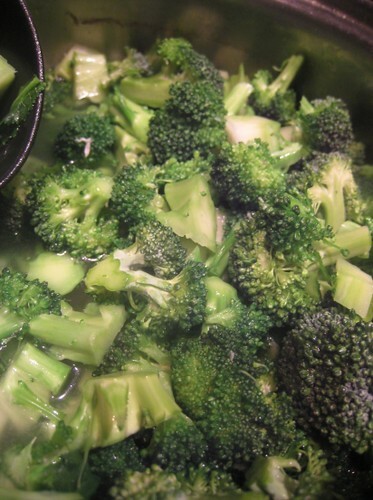 Thanks for turning out a yummy recipe for broccoli! I was a bit concerned (ask Wiffy) when you mentioned that broccoli is hard to do! Of course I feel a bit guilty because I was the one who chose broccoli! But I know the two of you will rise up to the challenge!!! and you did it wonderfully! or should i say, deliciously!!! I love the sound and flavours of this dish. Despite the many photos, it's really not that hard and a good way to use up leftover chicken/turkey. I love that you said "we ate it with rice, of course" Oh, rice makes everything better. This looks really delicious. I like your approach to the sauce, and while I agree that the chicken breasts are really not the best part of the bird, they make a great vehicle for sauces. 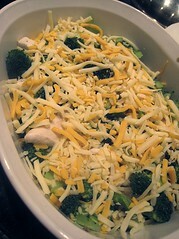 I don't think I've ever had broccoli with cheese... strange, because broccoli is one of my favorite foods, but true. wow! that looks delicious! i'm definitely trying it! 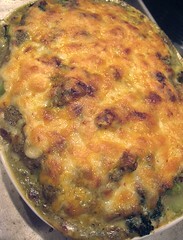 Wow, what a great twist on broccoli and cheese! 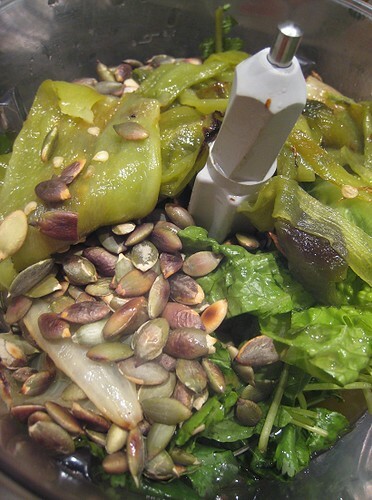 I've always been curious as to how to use pumpkin seeds and your pipian verde looks like just the thing to try. Nice! I love pipian, in fact, I just uploaded my mom's recipe for pipian. Isn't that funny? Hehe, great recipe girls! "Broccoli can be one of those 'what shall we do with this' kinda foods." It's a farily new discovery for us too! "I fear this round is a whole lot of stir-fries..."
Haha, I know! I saw your post on the reader and couldn't help laughing out loud at the coincidence! Being "difficult" totally pays off, eh? I love love love your idea! They still have chicken broccoli and cheese at whitespot and its delicious!